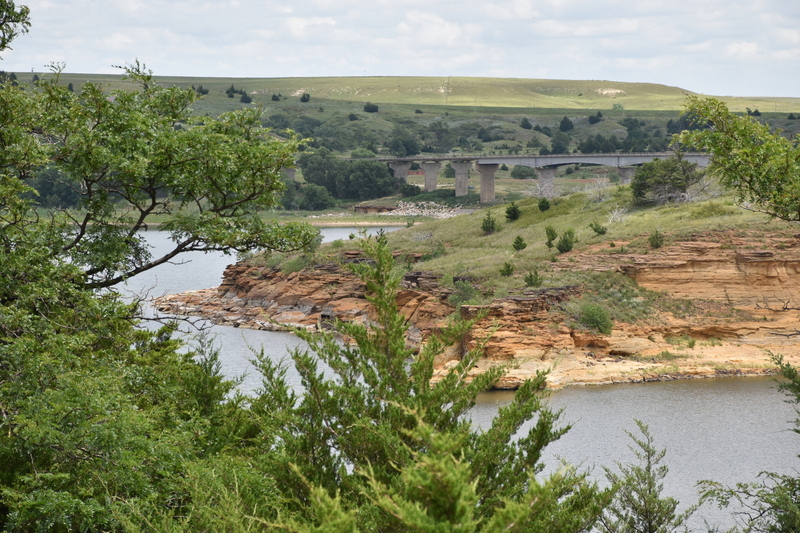 Milford Lake State Park is an awesome place to camp and chill for a while - one of the best camp sites so far. The park does have hiking trails, wildlife - turkeys running wild everywhere - and apparently mountain biking but as the typical theme continues, I had to move on. It has been a lot of driving since the first day in Florida and I was getting frustrated by the lack of mountain biking I found and in general, outdoor activities. I blame myself for this because anyone could find something to do but I somehow wanted more specific terrain - AKA mountains. Actually, a good mountain bike trail would suffice even if it consisted of rolling hills and had some technical sections - even a cross country trail would work. I left Milford Lake State Park and headed to an IMBA epic trail - Switchgrass in Wilson State Park and it was only 100 miles away. I was excited to be headed its way. As I drove, the landscape became more enjoyable to me. I knew just a few miles away were 'real' mountain biking trails and just beyond that were the Rockies. 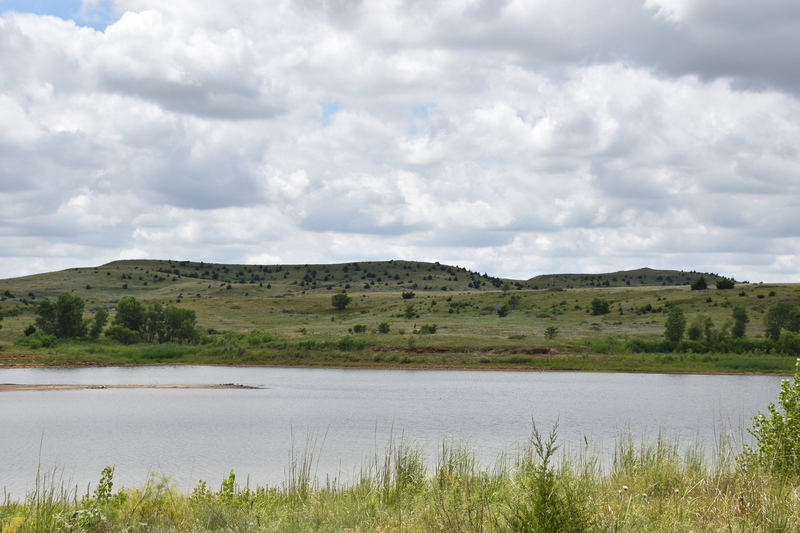 The rolling hills, the plains and one huge windmill farm later, I entered Wilson State Park. 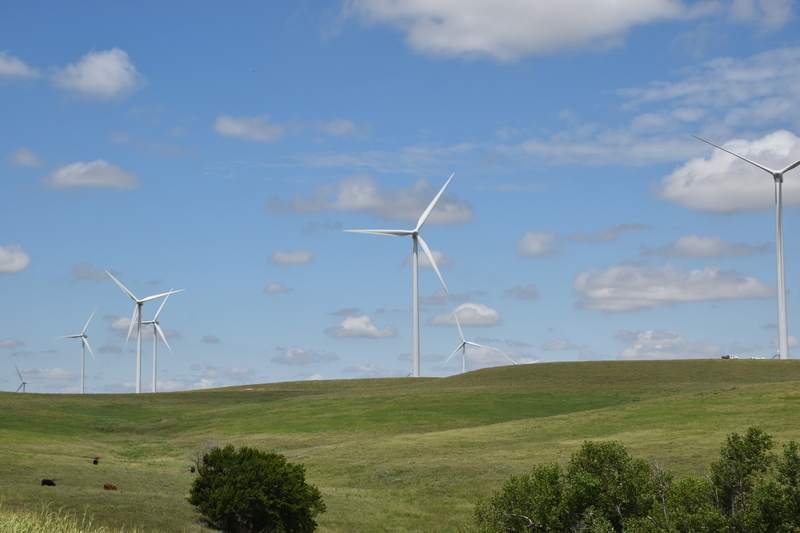 I had to stop a take a few photos of the Smokey Hills wind farm because I have never encountered such a beast. 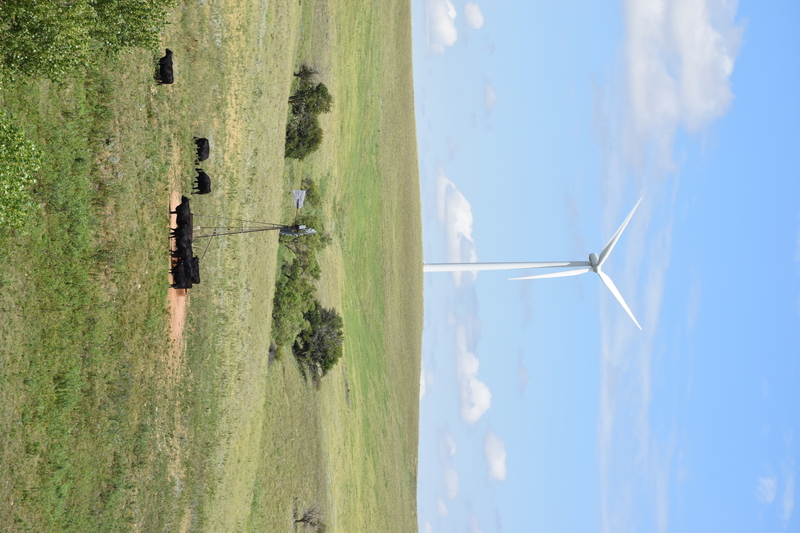 Smokey Hills wind farm. 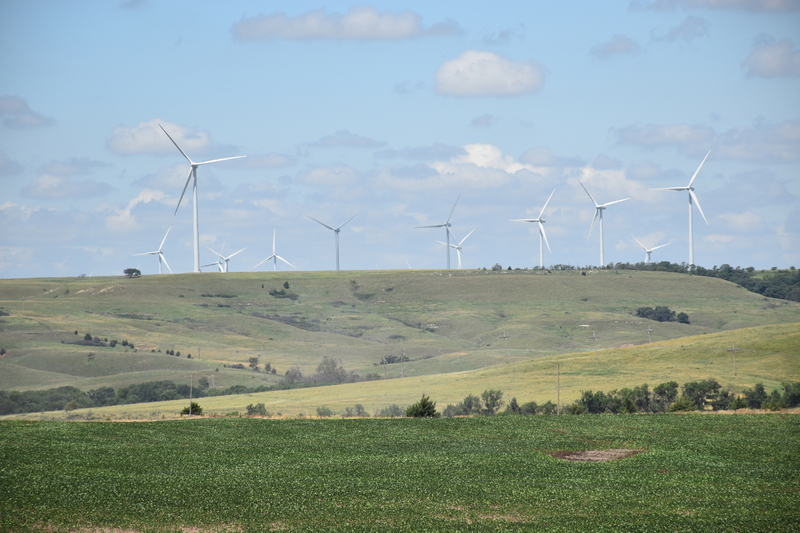 Another shot of the wind farm. Does this not portray west Kansas quite well? 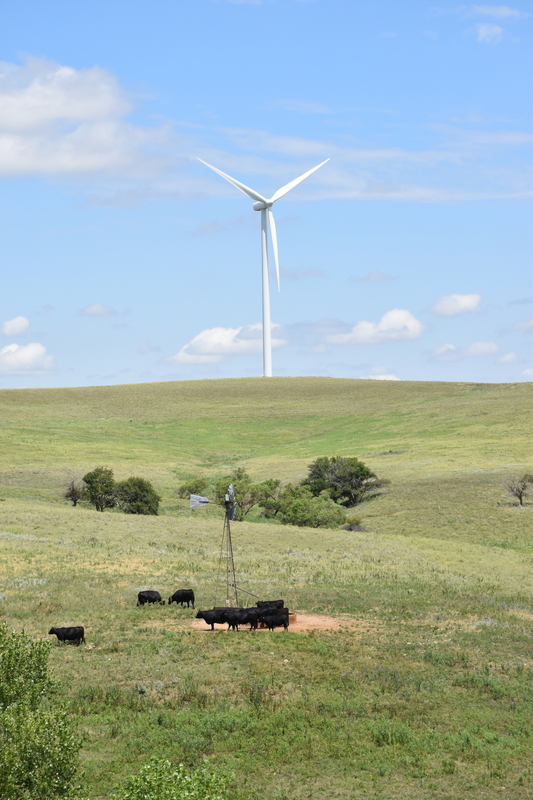 Cows, rolling plains and wind farms. 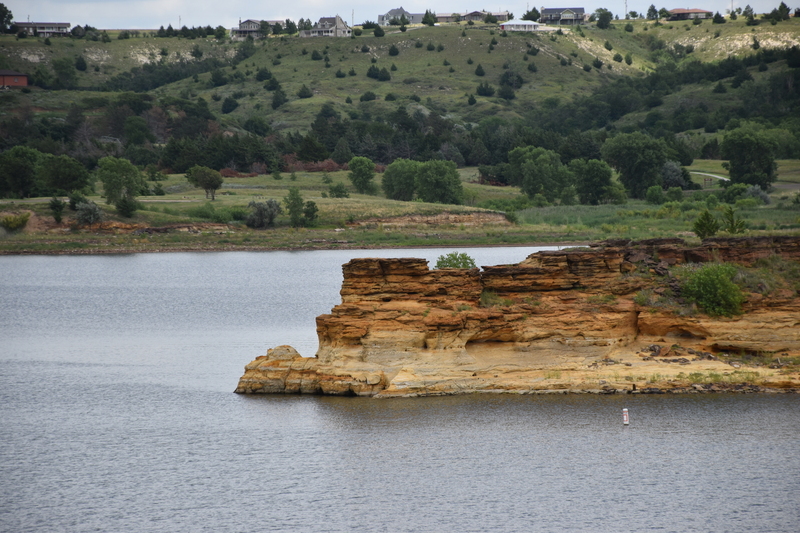 As I entered the park, I noticed these sweet multicolored sandstone rock cliffs surrounding and piercing into Wilson Lake. No wonder I saw signs at the front gate about the no diving policy. Of course we are going to dive. 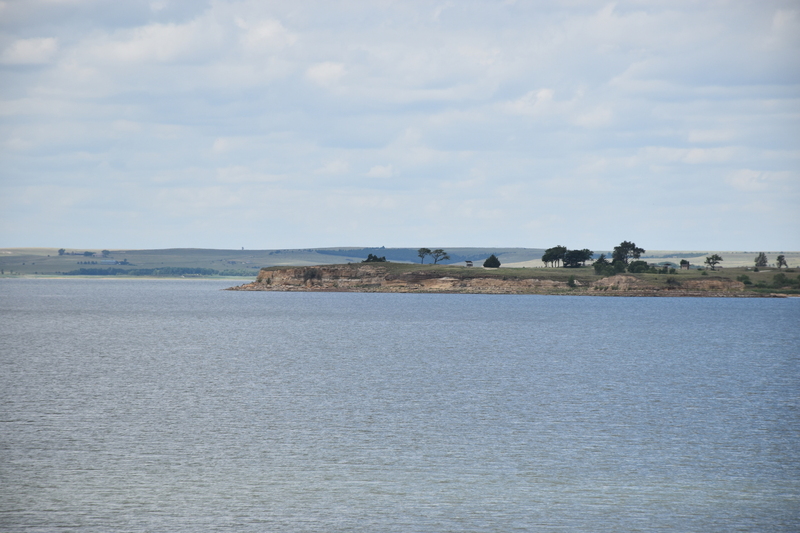 First sighting of Wilson Lake. I liked the scenery and landscape and knew I made a good decision stopping there. And then I saw the sandstone cliffs. 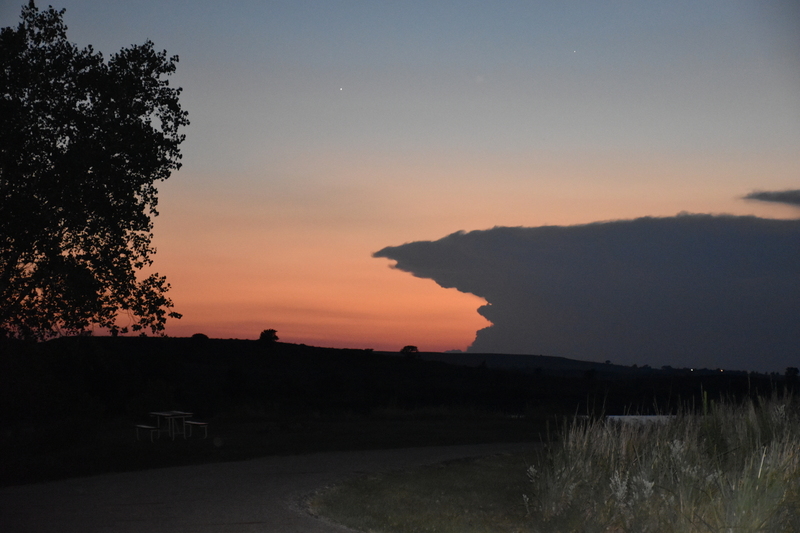 Unique for Kansas. A closeup of the multicolored sandstone cliffs. Sandstone cliffs through the trees and a bridge that I have to explore. 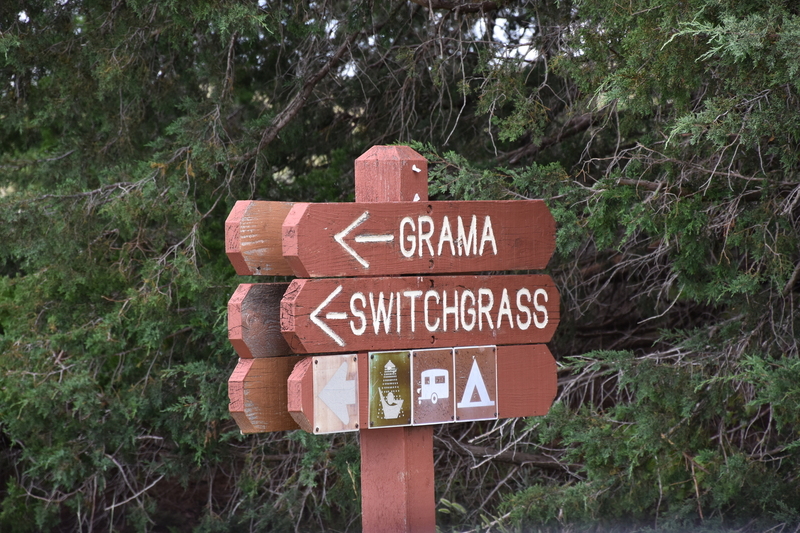 And then I happened upon a sign that made the drive even more worth the effort - Switchgrass. After I prepped camp, I road Switchgrass - Golden Belt Loop for the most part. It is a nice flowing, open trail with a few technical climbs - worth every second of effort in the blazing 100+ degree day. It is just what I needed. After the ride - Well - of course I had to stop by the crazy cross country / mountain bike guy's site to chat. We talked about our trips and he shared that his trip began in Colorado and was ending in Ashville, NC. Keep in mind, Kansas was 100+ degrees and this guy, Chris Reichel , was trailering 80+ pounds of gear. It cracks me up every time I think about his setup! Adding to Chris's already insane adventure, he barely avoided a Tornado as he slept in a tent a few nights prior. After talking for a while, Chris suggested heading into town for food and beer which I thought a great idea. If you camp Wilson State Park, just down the road is a cool little place called the Old 40 Bar and Grill that might be worth a visit. The food was good, the place was clean and the beer was cold. Afterward we road Switchgrass - Golden Belt Loop and Chris caught some carnage for the effort. That is me seemingly endo'ing for no other reason than beer made me do it. 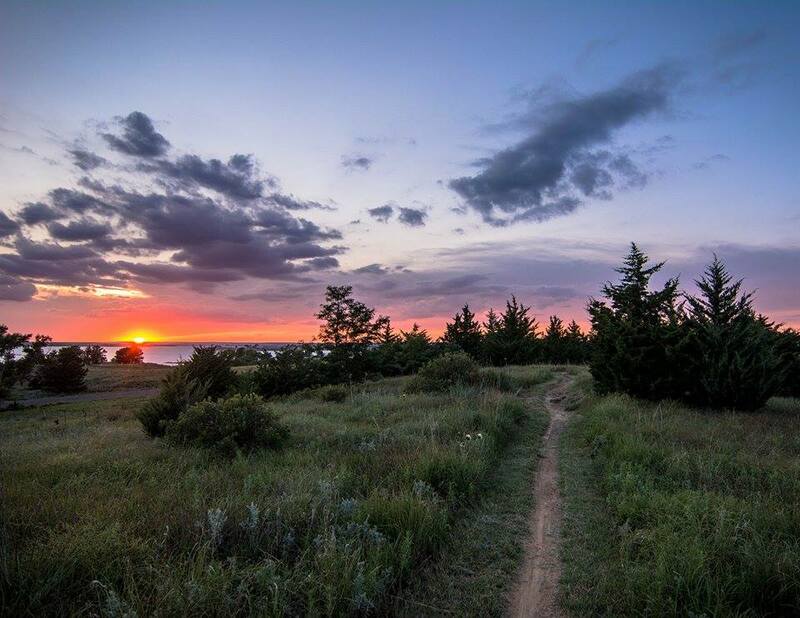 A nice photo by Chris Reichel of sunset on Switchgrass trail. If you want to follow along on some of Chris's adventures check him out on The Reichel Cycle - @thereichelcycle. I especially enjoyed the mountain biking photos he took in Nepal - an adventure he went on after his cross country trip. He does get around. One of my favorite photos he took from Nepal. 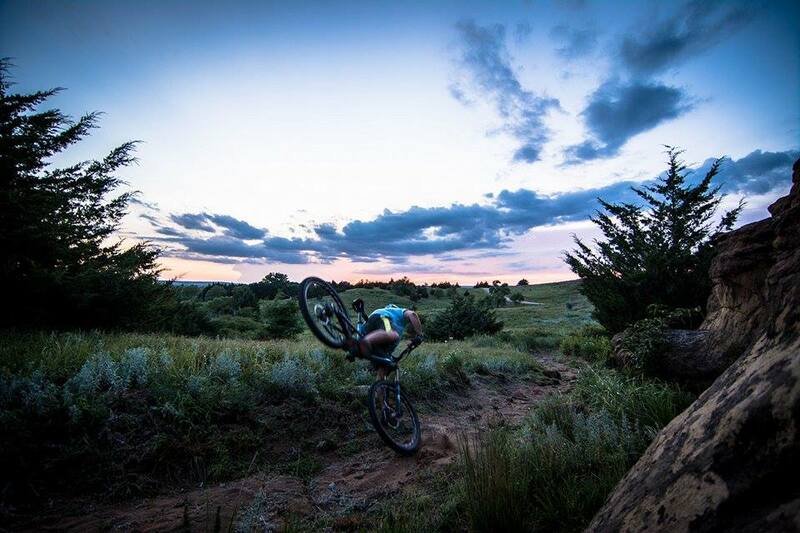 Who doesn't want to mountain bike there right now? It is INSANE beautiful. After the ride and a little scuffed up, I crashed out for the evening dreaming of trails soon to be ridden. It was a good day. Until tomorrow - keep living your dream.